The Baroque artist and Diplomat. 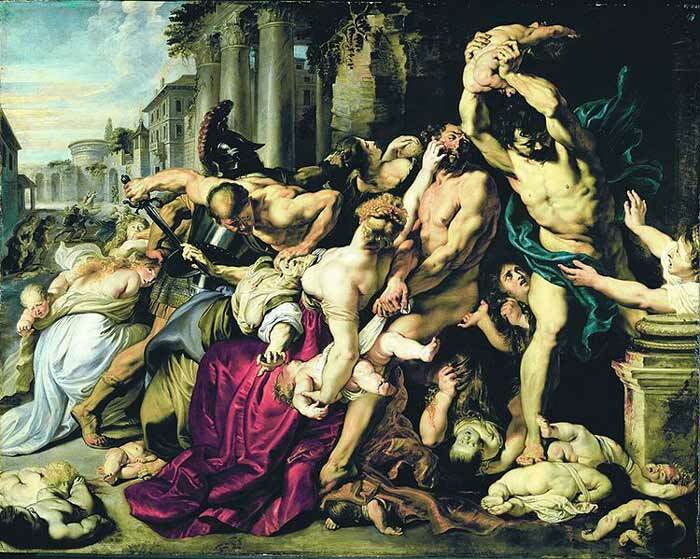 The great 17th-century Baroque artist Peter Paul Rubens was born on the 28th June 1577 at Siegen, Westphalia in Germany. He was greatly influenced by the Italian Renaissance artists Michelangelo, Raphael and Leonardo da Vinci in addition to the Venetian masters Titian, Veronese and Tintoretto. His father Jan was a barrister and Peter Paul was the sixth child of Jan and his wife Maria Pypelinckx. The family had fled Antwerp because of the persecution of Protestants by the Spanish Duke of Alba (Jan was a Calvinist) at this time the Netherlands were controlled by Spanish rule. On the death of her husband in 1589 Maria returned to Antwerp with her six children who she raised as Catholics. Rubens artistic education started as an apprentice to Tobias Verhaecht, he also studied under the leading Antwerp artists Adam van Noort and Otto van Veen. He completed his training in 1598 by becoming a Master of the Antwerp Guild of St Luke. 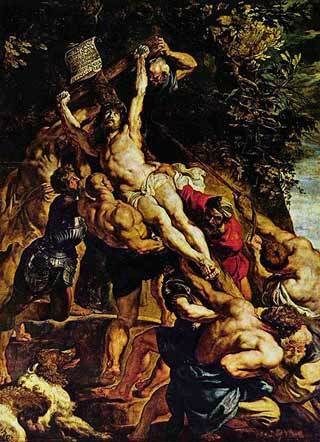 Throughout his career, Rubens was a fervent traveller. Arriving in Italy in 1600 he settled in Mantua becoming court painter to the Duke of Mantua, Vincenzo Gonzaga where, (except for a diplomatic journey to Spain in 1603), he remained for eight years. Between 1606 to 1608 he lived and worked in Rome where he was influenced by his contemporaries Caravaggio and Annibale Carracci. Unfortunately, the artist's mother had contracted an illness that hastened Ruben's return to Antwerp. He left Rome in 1608 but arrived too late, his mother had died before he could make it home. On 23rd September 1609, Rubens was appointed Court Painter to the Archduke Albert VII of Austria and his wife, The Infanta Isabella Clara Eugenia, the Habsburg Regents in Flanders. 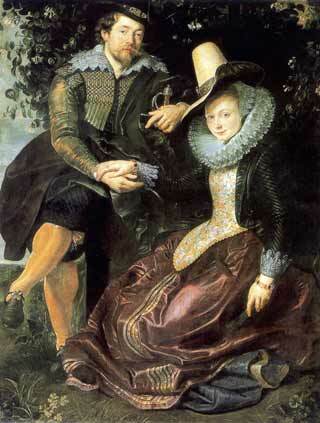 Although the Habsburg Court was in Brussels Rubens obtained special permission to base his studio in Antwerp. On October 3rd he married the daughter of an Antwerp barrister, Isabella Brant and painted a self-portrait with his new wife. Ruben's workshop was very successful with many apprentices learning their trade from the master painter. His Altarpieces for Antwerp Cathedral, The Elevation of the Cross and The Descent from the Cross, established the artist as the leading painter in Flanders. This superbly executed painting represents the four continents of Asia, America, Europe and Africa twined with their respective rivers. In the foreground, the river Nile has his arm around the black beauty of Africa. Behind them on the left of the picture are Europe with the river god of the Danube. On the right is Asia with the Ganges and at the back is America with the god of the Rio de la Plata. The Earth is represented by Cybele, the Mother of the Gods, who holds a horn of plenty in her right hand. The sea god Neptune represents water and the union is blessed by the goddess of Victory who has descended from Mount Olympus. Rising from the sea is the Triton who celebrates the union with a blast of his conch. 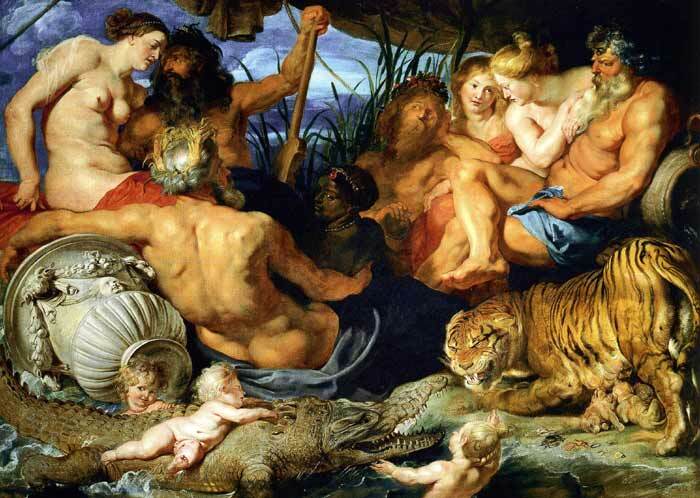 The union of Earth and Water is designed to bring wealth and prosperity for all of mankind, Rubens has drawn on the influence of Italian art and the classical statues from antiquity in his creation of this masterpiece. This is a real Clash of the Titans moment with Perseus rescuing the naked Andromeda from the Kraken (you can just see the stricken sea-monster at the bottom of the painting). The beast has been turned to stone by the reflection of the Medusa on the shield of Perseus. The winged horse Pegasus completes the picture. 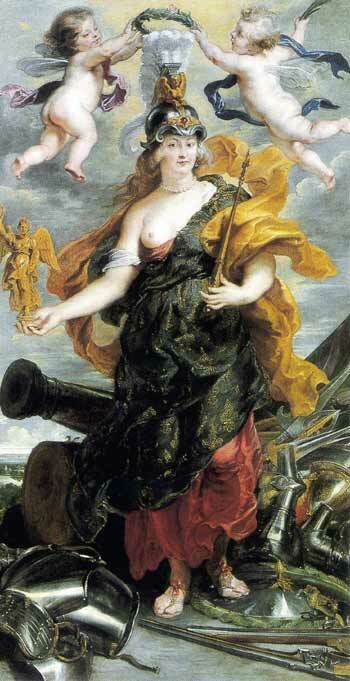 In February 1622 Rubens was commissioned to produce a large series of paintings, The Life of Marie de' Medici. Marie was the second wife of King Henry IV of France. Following her husband's assassination in 1610, she became regent until her son, the future King Louis XIII, came of age. She was a member of the powerful Medici banking family of Florence. The Medici were great patrons of Renaissance art and Marie herself was famed for her own artistic patronage. It's difficult to imagine a modern-day Queen posing, bare-breasted, for an official portrait! His Habsburg employers entrusted the artist as a diplomatic envoy and he received a monthly allowance, decreed by The Infanta Isabella, Vice -Regent of Flanders. 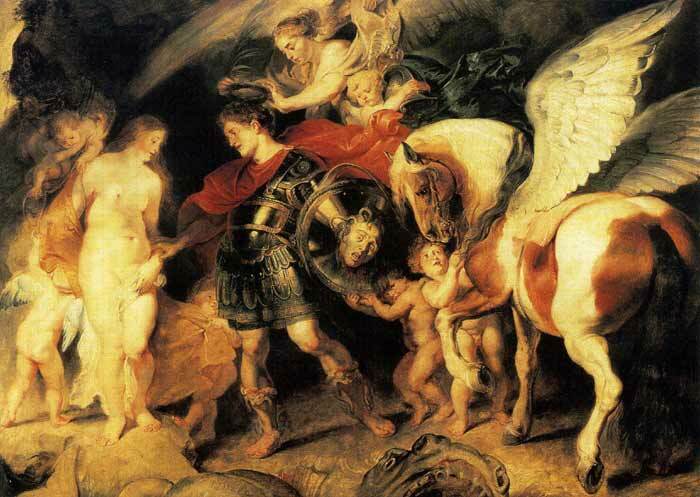 Rubens travelled between the Courts of Spain and England and his missions were rewarded with two knighthoods, the first in 1624 by Philip IV of Spain and then by Charles I of England in 1630. His diplomatic work did not seem to have an adverse effect on his art, in addition to his work for private patrons, the prolific painter completed many commissions for Philip of Spain. Sadly it was during this period that his wife, Isabella Brandt, died on 20th June 1626. On 5th June 1629, Rubens arrived in London to conduct peace negotiations between England and Spain. He painted his Peace and War and presented this allegorical work to Charles I. Charles also commissioned him to work on a series of nine ceiling paintings for the Banqueting House in London. Further recognition of the artist's skills came when he was made an honorary Master of Arts by Cambridge University. The artist returned to Antwerp from London in April 1630 and on 6th December married Helene Fourment the daughter of a rich tapestry dealer Daniel Fourment. Helene was sixteen years old when she married the fifty-three-year-old artist, she inspired many of the artist's later works acting as a model for many of them. Ruben's portrait of her in a fur wrap is a particularly famous example of the artist's intimate obsession with his new wife. In 1634 the city council of Antwerp commissioned the artist for a series of sketches of triumphal arches. these were designed for the ceremonial reception of the new Governor, the Cardinal-Infante Ferdinand. 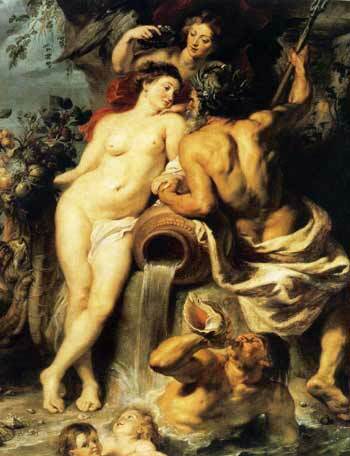 Rubens was made Court Painter to Ferdinand and received a commission for 112 paintings based on Ovid's Metamorphoses. In 1635 the artist purchased the Chateau de Steen near Elewijt, a village in the municipality of Zemst, Flemish Brabant, Belgium. He was to spend many summer months at the Chateau where he painted his final landscapes in and around the locality. Portrait of Helene Fourment in a Fur Wrap. (w) Oil on wood. 176 x 83 cm. This was the artist's final self-portrait. 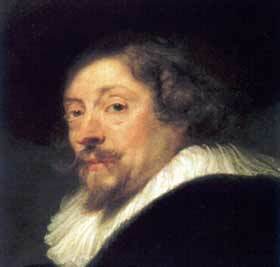 Rubens, who was suffering from gout, wrote his will on 27th of May, he died on 30th May 1640 at the age of 62. The cosmopolitan artist had assimilated the many lessons learned from the Italian Renaissance and created his own artistic legacy. Along with his Italian contemporary Caravaggio, he epitomised the Baroque style that was prevalent immediately following the Renaissance period. 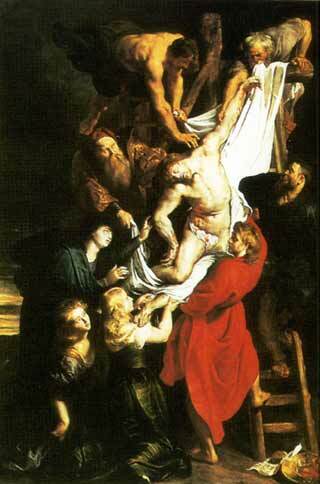 This work was only attributed to Rubens in 2001. It was thought to be by one of his assistants until an expert in Flemish art (George Gordon) recognised the painting as the work of the master himself. It was sold at auction at Sotheby's on July 10th 2002 for the sum of £49.5 million. It is a very dramatic and quite graphic account of the Biblical story in which King Herod orders the slaughter of every new-born male child in the village of Bethlehem. His motive was to avoid the loss of his kingdom to the King of the Jews whose birth had been announced in a prophecy.